There are two notable changes in this update. First is the removal of the stereo pairing option for HomePod that we saw in beta 1. Whether the feature was removed ahead of an official launch alongside HomePod firmware or due to problems is unknown at this time. Secondly, a new (PRODUCT)RED wallpaper is offered as part of the second beta release. The new wallpaper, which first launched with the (PRODUCT)RED iPhone 8 last week, is still limited to those models, leaving owners of other models like the iPhone X out in the cold. 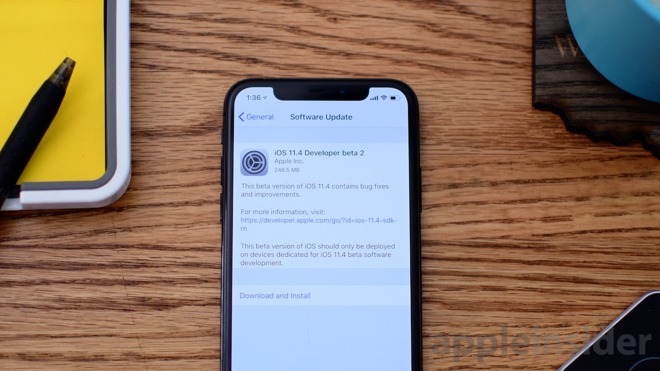 Other changes we saw in the first beta of iOS 11.4 include the return of Messages in iCloud, the first iteration of the ClassKit framework for developers, and more. Those features continue to be refined in the second beta release. Have you noticed anything else in the second beta? Let us know in the comments.